How long have you worked at The Conservation Center? What is your previous experience in shipping and installation? I’ve been with The Conservation Center for six years now. In the past, I worked for the Academy of Art College in San Francisco as well as various galleries and antique dealers, including Pagoda Red, one of Chicago’s premiere Asian antique dealers. 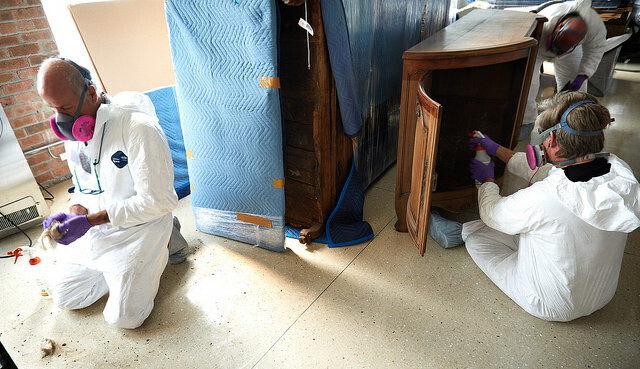 The handling, shipping, and installation of valuable artwork is a very behind-the-scenes process. Doing it correctly takes experience, patience, and countless white gloves. For instance, this winter we had hundreds upon hundreds of valuable pieces transported back to The Center for examination. A difficult task when you look at the logistics of the job. How would you describe the team you work with here at The Conservation Center? The Shipping and Installation team here is a group of individuals who have all had years of experience handling valuable works of art. We all have degrees in Fine Art and have studied art history at one point or another, which gives us a greater appreciation and understanding of the pieces we see here at The Center. On any given day we face various challenges on how to carefully handle, ship, and install pieces of fine art in all sizes and mediums. We need to analyze each situation on a case-by-case basis and determine the best possible solution to the particular challenge at hand. The Center’s current team of art handlers is among the most talented group of individuals that I have worked with in a professional setting. Each of them has a specific skill set that they bring to the table. What is the most important aspect about teamwork at The Center? I feel that trust and communication between team members plays a significant role in getting a job completed. Whether it’s de-installing a large mural while atop scaffolding or packing a one-of-a-kind hand blown glass piece, both team members must trust each other’s judgment and communicate to work together in concert. One may have more experience with a certain medium or type of handling technique. In that case, both handlers need to trust that the best decision is being made for that piece of art. What is the most challenging disaster response case you and your team have worked on? We are called to all types of challenging situations, whether it be someone’s home has flooded, pipes have frozen and burst, or the most devastating—a fire. We are typically called within days after the immediate situation on the ground has been dealt with and the jobsite is deemed safe. On one particular call, we arrived on the scene to find the fire department had put out a fire shortly before, which then reignited. Everyone was evacuated until the site was declared safe once again. Luckily, there were no further incidents but the reality of how unpredictable a fire can be was evident on that job. Heather (our CEO) constantly stresses the importance of safety on the jobsite. We are provided the necessary training and supplied with all the proper safety gear for every onsite. Anything you have learned managing an experienced disaster response team? The old cliché, “expect the unexpected,” comes to mind. One example was an onsite for a client who had a fire in her building. After our presence in the building was known, several of her neighbors had requested our services. The job evolved from working with one client in one unit to assisting four additional clients the same day. Fortunately, we had enough packing materials on hand to accommodate the 200 plus items we picked up. Another thing we have all learned after years of doing this… wear some comfortable shoes, it’s going to be a long day! And of course, it is always gratifying for our team to help people in their time of need.